Psalm 119:11 says, "Thy Word have I hid in mine heart, that I might not sin against Thee." As parents, it's important to teach our children both to memorize God's Word, and to be "doers" of the Word by obeying it. In “B” a brother remembers to be kind by sharing with his little sister. In “D” children are encouraged to pick up their toys without complaining. In “H” children honor their parents through loving acts of thoughtfulness. In “T” a 13 year-old brother takes time to read the Bible to his younger siblings. In "Y" a young lady and her family are the "light of the world" to a harried restaurant waiter! 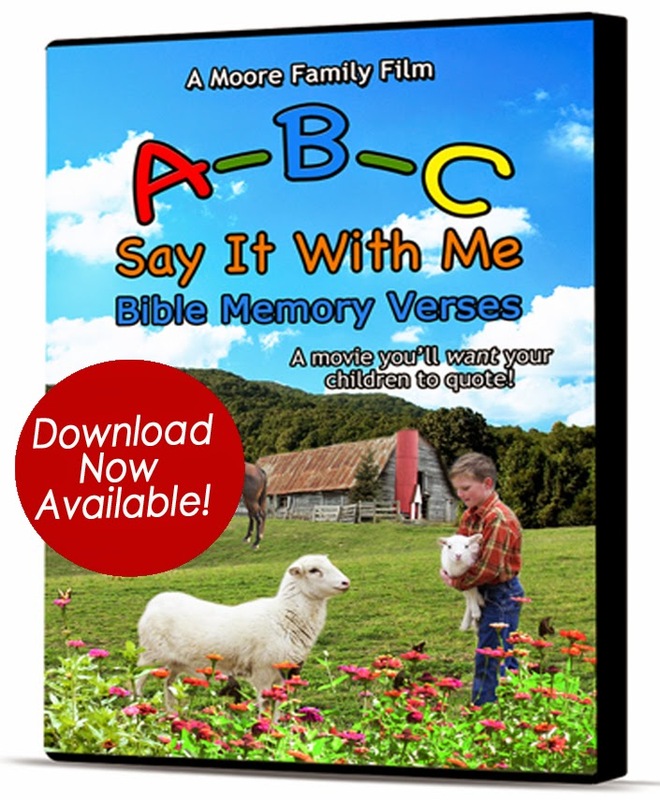 Filled with delightful music and endearing scenes of home, farm, and family life, ABC Say It With Me promotes family unity, Scriptural truths, and, most importantly , the gospel message of Jesus Christ. An enjoyable and easy way to memorize and apply the character- building truths of God's Word! DVD Bonus Features (not included on download version) include "Behind the Scenes" (6 min.) and promotional trailers for other Moore Family Films. 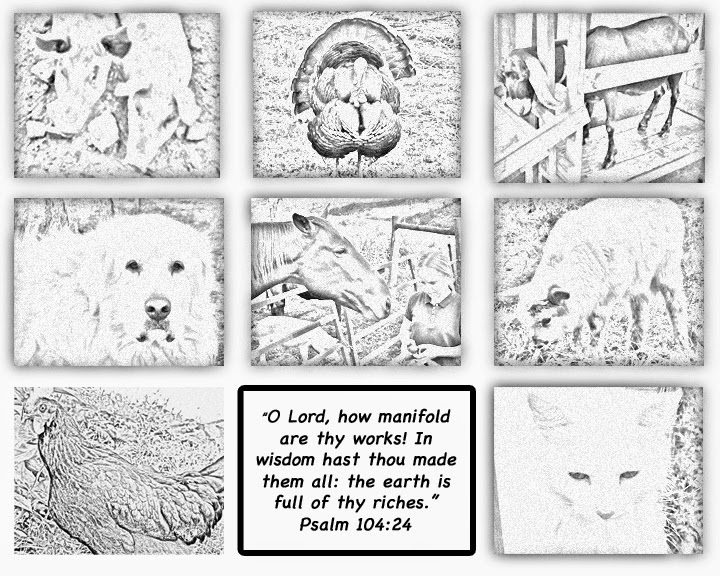 Coloring Sheet - Features farm animals and Psalm 104:24, used as the "O" verse in this film: "O LORD, how manifold are thy works! in wisdom hast thou made them all: the earth is full of thy riches." Please print as many as you'd like! NEW! List of ABC Bible verses with references - This can be used as a quick reference for reviewing the verses with your child, or can be used as copywork for your child's handwriting practice! "My little ones love this video! Thank you so much for making such a fun way to practice verses and see other children practicing doing right! We have so many favorite parts it would be hard to name them all here. My 4 year old loves seeing all the animals we have learned about and seeing the kids interacting with them. And the costume parts. He loves pretending. My 2 year old giggles with delight at several points throughout and is just as attentive as her brother. As a mom, I am encouraged by the video as well. I highly recommend it to any families I know, especially those who are trying to train their children to please God!" This is such a wonderful idea! Thank you, Moore Family Films, for giving of your time to produce quality, family-friendly films. My children will ask to watch this movie often, I'm sure! This looks great! What a fabulous teaching tool! Does the Free Shipping include Canadian Adresses? We're sorry, but due to rising international shipping prices, free shipping is for the continental US only. 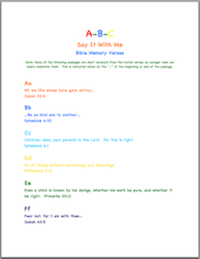 We are using the King James Version for the ABC Say it With Me DVD. Hi! This dvd looks wonderful! When is the dvd coming out? I saw that the ad said summer, but I was wondering what month. Thank you! So cute! My four year old was instantly captivated. I would love a copy for my homeschool. I think it will be great for my 7 year old and 2 year old as well. What a wonderful way to incorporate learning letters with hiding the Word in their hearts (and Mom's too)! Our boys are just turning 3 and very curious about letters. This would be a great resource. I can't figure out how to add my name. This is Sandi :). So great!! How long does the video last? Thank you for asking! Since the video is not complete, we don't have an accurate run time. But, we are hoping it will be around 45 minutes long, perhaps a bit longer. Just wondering when this video will be ready to ship out? I have already pre ordered it. We will be sending "ABC Say it with Me" out to the duplicating company this week! Hopefully they will be able to attend to it quickly. So, Lord willing it will be shipping by the end of the month. Thanks you so much for your patience. Blessings to you also! Hello. This dvd looks great and I know our boys would love it! I was wondering whether perhaps it will be available for download, sometime in the next few months? We live in Australia and the postage to order is quite high. Thank you. Beth W.
Hi Beth! We're getting ready to send an e-mail to our subscribers announcing that our ABC film is now available for download! Just wanted to let you know. Hello, we recently received your DVD in the mail! I just wanted to say thank you for making such a wonderfully inspiring film for children! My two year old loves this film!!!! I'm so grateful to have this film that presents 26 verses in such clear & beautifully sweet illustrations. Just wanted to say thank you! Hi Anna! Thank you so much for the wonderful encouragement. We're so thankful that your two year old is enjoying the film, and we pray that it encourages memorization and application of God's Word. We feel that the Lord graciously gave us the thoughts and ideas for the illustrations that go with each verse. To Him be all the glory! We have had your DVD for a week now and our children love it!! They already have A-H memorized. What a blessing it has been! Thank you so much for making it and all your others. They have been a true blessing to our family!! Praise the Lord! That's the goal! Our prayer is that children (and adults too) will be encouraged to memorize God's Word and apply it by watching this film! Even though it may be a "bit entertaining," (smile) the goal of the film was just that. Thank you so much for encouraging us. What a blessing! Please tell your children we are so thankful they've already memorized A-H! Keep it up, for the glory of God! The bottom line is this is a wonderful DVD!! Hi Lindy! Thank you so much for the wonderful, thorough, detailed review of ABC! Although it was unsolicited, it was by far the most comprehensive review we've had yet. We're touched and humbled that you would take time out of your busy schedule to write such a thoughtful review. May the Lord continue to bless your sweet family! Thank you for making this video. My youngest is two and she has already started saying the verses ( in her own sweet toddler version ��) and acting out different scenes. Even my 13 year has said she wasn't even focused on memorizing the verses but they have sunk in her heart none the less. The teachable scenes for each verse are great everyday examples of how to apply the scripture to our lives. Hello I just read about this DVD on the Growing Home blog. Just like one of the other commenters, I live in Australia. Wondering if the DVD is suitable for all regions or just North American (region 1). Thank you! Hello Catlin. The DVD is suitable for all regions. Thank you! Hi DeAnna. Yes! All the Scripture verses are recited in KJV. Thanks for inquiring. I am also in Australia and would love to have a download of this dvd. I've been looking at this DVD for a while, and need to fit it into the budget! What a great way to memorize scripture! We love our DVD! My 3 year old daughter asked to quote verses for us at dinner tonight. I loved seeing her excitement about God's word! She already knows the verses for A-F and several others. My 17 month old son loves it too! His favorite is F- Fear not, for I am with thee" He loves the faces your boys make and makes it each time it comes on! He also "sings" along with the hymns. Thank you so much for making such a helpful DVD! God Bless You! Can't wait to order some of your other DVDs! Tara and Lori, Thank you both for taking the time to encourage us. Praise the Lord that your children are learning to memorize God's Word! That's exactly why we made this film! To Him be all the glory, praise, and honor!! And thank you so much for your support! We purchased this DVD in July and love, love, love it. All of our children enjoy watching age 2-8. Thank you for this great DVD! Thank you so much for such an excellent product! What a wonderful testimony your family is. We just ordered ABC and my children love it. In less than 48 hours, they are on their 6th time watching it and have declared it their favorite video. By the 3rd time, they were referring to your children by name. They are particularly fond of Dobson and the baby. :) It's nice to have material produced by other homeschoolers, and they were thrilled to learn that you also use Christian Light Education curriculum. 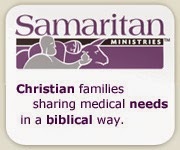 Like you (I saw a response you made in another post), we are not Mennonite, but have found much value in their wholesome and biblical teaching. We live in a much more urban area than you do, and it's sometimes easy to lose sight of the fact that there are other believers who live godly and separated lives. We are so delighted with this video that we have just purchased the others, as well as another ABC for a friend. May the Lord richly bless your family for your labor of love towards the saints. My little ones love this video! Thank you so much for making such a fun way to practice verses and see other children practicing doing right! We have so many favorite parts it would be hard to name them all here. My 4 year old loves seeing all the animals we have learned about and seeing the kids interacting with them. And the costume parts. He loves pretending. My 2 year old giggles with delight at several points throughout and is just as attentive as her borther. As a mom, I am encouraged by the video as well. I highly recommend it to any families I know, especially those who are trying to train their children to please God! Best Christian movie ever! Anytime our children get sick or need edifying we put it on ..it never fails to bless us.. We can watch it over and over and never grows old.. How can it it's God ordained and glorifying ! May Christ be lifted up ! Thank you Moore family for labor of love.. Never grow weary and may Ruth 2:12 be your portion in Jesus mighty name !